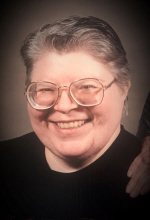 Nancy L. O’Dell, age 68, of Mattoon passed away at 9:27 a.m. on Thursday, November 8, 2018 at Carle Foundation Hospital in Urbana. Funeral services honoring her life will begin at 2:00 p.m. on Wednesday, November 14, 2018 at Schilling Funeral Home. Burial will take place at Calvary Cemetery. Visitation for family and friends will be held from 12:00 p.m. until the time of the service on Wednesday at the funeral home. Nancy was born on December 4, 1949 in Mattoon the daughter of Roosevelt “Lucky” and Mary (Tolley) O’Dell. Survivors include her brothers, Thomas O’Dell and Robert O’Dell; nephew, Michael Eugene O’Dell; nieces, Shannon Gardner, Aryele O’Dell and Eternity Carey; and special family friend, Dennis Smith. Nancy was preceded in death by her parents. Nancy worked at General Electric for 35 years prior to her retirement. She loved sports and was an avid Cardinals and Saints fan. Nancy enjoyed cross stitching and spending time with her friends and family. She will be missed by all those who knew her. To send flowers or a remembrance gift to the family of Nancy L. O'Dell, please visit our Tribute Store. "Email Address" would like to share the life celebration of Nancy L. O'Dell. Click on the "link" to go to share a favorite memory or leave a condolence message for the family.